As the 2015-2016 school year comes to a close, students happily take off to enjoy two-and-a half months of vacation before the new school year begins. As we’ve reported before, the nature of business on the island often means a new surge of workers and families arriving to San Pedro. While students enjoy lazy summer days, many of their parents are tasked with finding space to register and send them to school the next year. It’s been two years since Area Representative for Belize Rural South (BRS) Honorable Manuel Heredia Jr., promised the opening of a government school. There have been no signs of construction, and it seems likely that San Pedro will not have a government school this fall, despite the on-going requests by many island residents. 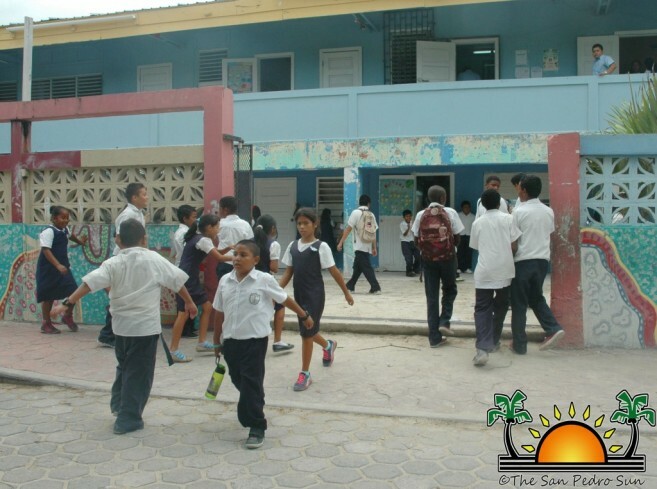 There are a total of three grant-aided, three private schools, and no established government school on Ambergris Caye. Many parents have spoken out about limited space, congested classrooms, and at worst, costly school fees. At the start of a new school year, many parents scramble to find a spot for their child at an affordable rate. The obvious answer, they believe, is to build another school to alleviate the congestion in classrooms and allow opportunities for students who cannot afford to go to private or grant-aided schools. The San Pedro Roman Catholic School (SPRCS) is the largest school in San Pedro, with close to 900 students. Principal at SPRCS, Roxanne Kay, understands the problem that San Pedro schools have when it comes to space. “One of the problems we have here at RC is that we lack space and we don’t see how we could add on more classrooms. My concern ties along to what the public is saying. If we don’t have where to put students, where will the students go? Other schools are private and are more expensive, making it difficult for low-income parents to enroll their children, and a government school could alleviate that problem,” said Principal Kay. In November 2014, the Government of Belize approved funding for the construction of a government primary school on the island and a total of $1.2 million has been approved for the facility, which does not include the acquisition of land. Now that funds are allocated, some question why it’s taking long to build a government school. In Volume #25, Issue 6, The San Pedro Sun quotes BRS Area Representative Heredia, who indicated he was still working towards the establishment of a government school. He also indicated that a parcel of land had been identified in the Sea Grape Drive Area, directly across the Bowen and Bowen Distribution Center located on Blake Street. He proposed that the government school would be open for the 2016-2017 school year. Upon inspection, the land in question shows no signs of construction, and no visible developments have been made. The San Pedro Sun reached out to relevant authorities to confirm if San Pedro will be getting a new school building for the 2016-2017 school year, and our calls to Heredia went unanswered. On March 14, 2016 San Pedro Education Officer Nelma Jones confirmed that there were plans for the construction of two government schools on the northern part of the island. However, in a recent phone interview with Jones, she stated that she has not received further information for the implementation of the proposed school. “There is an intent for a government school, but I don’t see that materializing for this upcoming school year. However, those matters are discussed at ministerial level, and has not reached to the technical level. Once those plans are finalized, the head of the Ministry of Education will be the first one to be notified, and then I will be informed of it,” said Jones. In the meantime, the schools on the island continue to find ways to accommodate more students. Jones mentioned that the Holy Cross Anglican School is looking to expand their campus to allow more students opportunities to enroll, and Ambergris Caye Elementary School has applied for grant-aid status. Since the 18.3 million dollar education reform project was granted by Caribbean Development Bank, many people across the country have benefited from the funds, and new schools have been built. They are: Belmopan-Kuxlin-Ha Preschool and Primary School, Toldeo- Santa Cruz New Government Primary School, Stann Creek-Trio Preschool and Primary School. On June 8th, the Ministry of Education sent out a press release which indicated that over 930 students Belize City/Belize District will soon benefit from the renovation and extension project at Gwen Lizarraga High School in Belize City. When will Ambergris Caye get their new schools?